I am sure we can all agree that we live in strange times. For most of us, education and intellectual progress were based on hard mental work, the exercise of logic, and the seeking of not only nuggets of truth but the interconnections between these nuggets. We understood the importance of knowledge; to put it in the modern lexicon, we sought data and reveled in it. The most rewarding application of this knowledge was in the betterment of society. We studied history, journalism, science, literature, and other subjects not only in order to advance knowledge but also to find ways to apply this knowledge to helping people. While knowledge in and of itself is beautiful the connection between knowledge and humanism was even more profound for so many of us. That world—the world that created us- is under attack. Truth means little. Consistency means even less. Double-speak— worse than anything Orwell could have imagined—is the language of today. Logic, rationality, humanism, and the basic tenets of liberalism are – if the Right wins—going to be consigned to the dustbin. This is not only about Trump. The world over, inhumane, illogical and mendacious bloviators have taken the seats of power and preside over the levers of power, including nuclearized-militaries. The world over, Rightist governments turn a blind eye to hooliganism. The world over, basic rights for women, children, minorities, and other communities are under attack. Racism and Misogyny are legitimate positions, normalized by citizens who, irrespective of their politics, feel disenfranchised and angry. Though the times are perilous, many well-meaning people lack the tools for legitimate fact gathering and protest. This is understandable, if unfortunate. Even in the Progressive world, we need a division of labor. Reaching the destination is simply too important for us to infight or attack each other; we cannot duplicate efforts or slow each other down in any way. Core to this is the massive enhancement of real journalism. Journalism- in an ideal world- is a profession of incredible importance and integrity. Good journalists are amongst the most dexterous and skilled people in the world. We have all benefited—yes each one of us- from the work of indefatigable journalists who put life, limb, and even sanity on the line for the truth. A combination of Rightism and myopic profit-driven capitalism have denuded the ranks of real journalists. Take the example of India: One-eighth of the world’s population lives in rural India yet we can count on one-hand the journalists working in mainstream publications who exclusively cover the rural areas. Unfolding in India is one of the most serious human tragedies in history- grinding poverty, increased malnourishment, agrarian collapse, suicide, and a myriad of other egregious acts of man-made violence. Even as we read this manifesto, people are suffering and dying for synthetic reasons, inherent in our economic system. Yet, only a few journalists are telling the stories of these hundreds of millions of people and even those who are doing so are beleaguered, fatigued, and scraping to make ends meet. Journalism is not about “them.” Journalism is about “us.” There is no sane, decent, and democratic polity possible without journalists who challenge power, dig for and disseminate the truth, and then find the next story to tell. In 2017, we must find a way to enhance journalism- real journalism- investigative, fact-driven, and relentless journalism. Society can decay if we let it. But we don’t have to. Not only journalism, the need of the hour is sincere journalists who do not be cowed down by the threats of rulers – whether in Manipur or Chhattisgarh or in Syria or Palestine ! This year, many journalists faced censorship, right-wing and terrorist attacks. They were tortured and imprisoned for reporting ‘ facts’ thereby incurring the ire of state. Many faced state terrorism . But, still genuine journalism prevails. 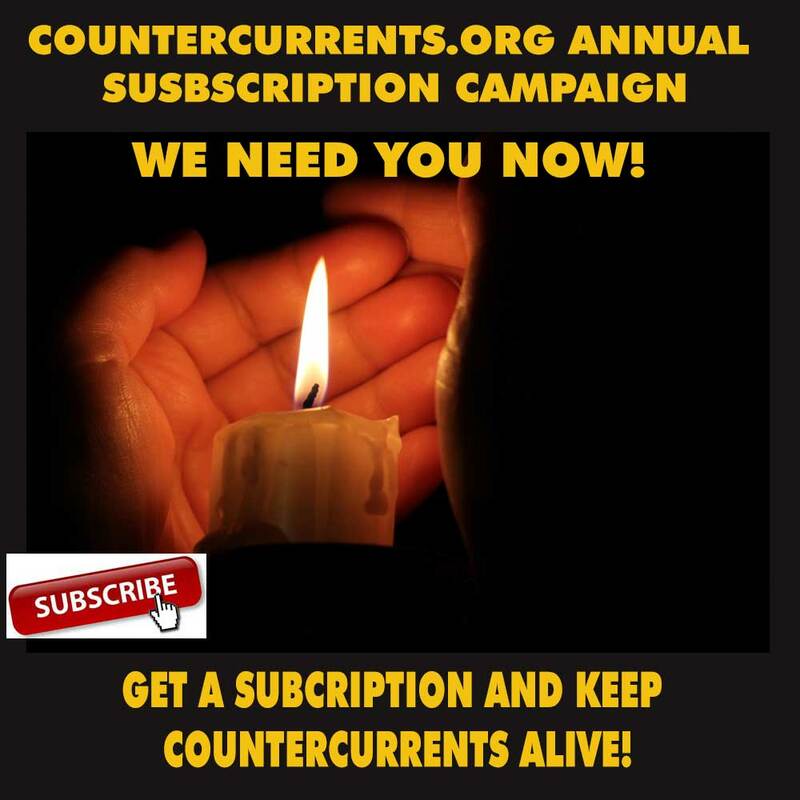 And one of the most ardent supporters of true, free and fair journalism is this great site – countercurrents ! As long as there are ‘ hearty’ supporters, this effort will not go waste !